Vishal Krishna is all set to get the biggest-ever opening for his "Poojai". Along with Ilayathalapathy Vijay's "Kaththi", this film is releasing as a Diwali treat for the Tamil audience. "Poojai" is directed by Hari and it is a mass-masala entertainer made in his usual style. The film is releasing in above 1000 screens. The most stunning part of the story is that the flick is getting a warm reception in Andhra Pradesh where the Tamil movie is releasing in 400+ screens. After a long gap, Hari has teamed up with Vishal Krishna again. They had earlier worked in "Thaamirabharani". For the first time, the actor is romancing Shruti Haasan on-screen, which has become one of the attractions of the film. Veteran actor Sathyaraj has a key role in the flick. The film has a huge cast. Soori, Mukesh Tiwari, Jayaprakash, Manobala, Sithara and many others are in the cast. When it comes to the technical team, Yuvan Shankar Raja has scored the music, Priyan has handled the camera and VT Vijayan with TS Jai have taken responsibility of the editing department. The early reviews emerging from various sources say that "Poojai" has impressed Vishal Krishna and Shruti Haasan's fans. It is said to be a typical Hari's action entertainer filled with loads of mass elements. Find below what audience are saying about the film on Twitter. Sumos flying, villains bounce off the ground, chases, romance, family drama and comedy. Repeat this a few times and that's #Poojai for you. 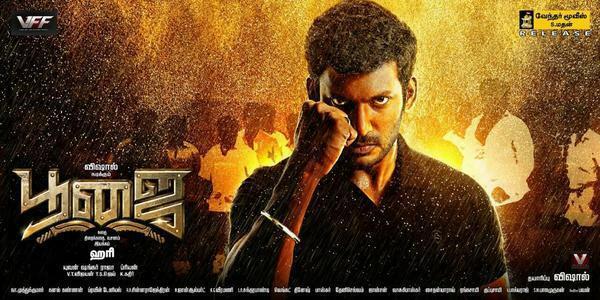 Boking tickets for #poojai , body guard muneesvarar thunai!